come take classes with me at Quilt Festival in Cincinnati! Are you headed to Cincinnati for International Quilt Festival that starts next week? If so, I'd love to have you join my in my classes there! I'm so excited to be teaching at Quilt Festival, and am incredibly honored that I am teaching four classes. If you'll be at Festival for preview night, I will be participating in the Open Studios on Wednesday, April 10 from 5:15-7:00, so please join me there. I'll be creating some improvisational quilt blocks on the spot, so that should be a lot of fun! 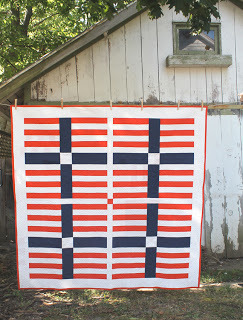 On Thursday, April 11, I'll be teaching an all-day workshop on Modern Strip Piecing. Students will be making their own version of my You + Me quilt and I can't wait to see all of the quilt tops that we'll create that day. The class runs from 9 am until 5 pm, there's a two hour lunch break between noon and 2 pm, and the cost is $73. Here's a link to the course catalogue where you can read more about my Modern Strip Piecing and find out how to enroll onsite next week. That night the Cincinnati Modern Quilt Guild is hosting a Modern Meet-Up at Nicholson's from 7-9. We will be celebrating our exhibition at Festival and we have lots of great prizes to give away, too! You can read more about the Meet-Up on the CMQG blog here. On Friday, April 12 I'll be teaching a workshop on binding and finishing your quilts. I bind everything using my machine, so I'll be teaching the methods that I use to achieve neat corners, crisp binding, and smooth seams through the edges of my projects. This is a half-day class that runs from 9 am until noon and the cost is $39. On Friday afternoon I'll be teaching a workshop on Color Theory and Interaction for the Modern Quilter. We'll learn about the basics of color theory and interaction through both discussion and hands-on activities. The class runs from 2:00-5:00 pm and the cost is $39. edited to add: this class is sold out! And finally on Saturday, April 13 I'll be teaching an all-day workshop on Modern Improvisational Patchwork. I'll show a variety of different ways to construct completely unique and one-of-a kind quilt blocks. This class runs from 9 am until 5 pm, with a two hour lunch break between noon and 2:00 pm. The cost for this class is $73. I hope you can join me for one or more of my classes! Pre-enrollment for Quilt Festival is over, so you'll have to register on site for the classes. Again, here's the link to the catalogue for more information.